RazorPay is one of the most secured online payment gateways as it has an industry standard 100% PCI DSS Compliant & Certified solution. Razorpay allows Indian businesses to collect online payments through various modes such as credit card, debit card, net banking, and well-known wallets like Jio Money, Mobikwik, PayUmoney, Airtel Money, FreeCharge, etc. RazorPay software private limited was established by IIT Roorki alumni with an aim to provide best online payment platform that has developer friendly API and simple integration. The company offers fast, cost-effective and secured online payment platform to schools, merchants ecommerce and other institutes and organisations which helps them to accept payment through different mediums such as debit card, credit card, Net banking and E wallet.The company has been long associated with reputed organisations such as Y combinator, Tiger Global management, Matrix and MasterCard. The platform provides a safe link between the respective websites and different issuing institutions such as banks and payment gateway providers. RazorPay is quite different from other payment gateway providers because it is developer oriented and easy-to-integrate gateway. Making the checkout process effortless, the platform for offers 24x7 support.It has a user-friendly dashboard where the customer is required to fill necessary details and attach documents. The portal will verify the activation and send a conformation through mail, and get the users form verified from leading banks so that they can easily accept payments. Build your business for scale with our complete API-driven automation that requires zero manual intervention. PCI DSS Level 1 compliant solution which removes your burden of regulatory compliance. We now have evolved from being a pure payment gateway to a converged payments solution, making us the first Indian fin-tech company to offer end-to-end payment solutions. With new products, we empower businesses to handle all aspects related to the flow of money. We bring to you The Future of Payments! Q. 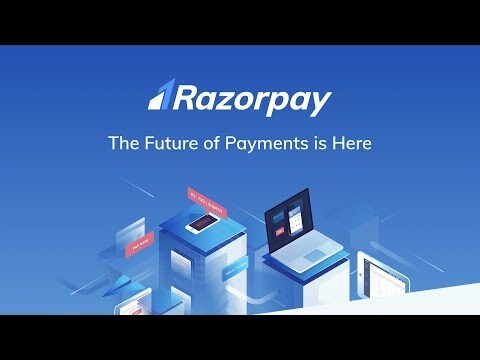 How is Razorpay different than other payment gateways? We are a developer-oriented and easy-to-integrate gateway. Our API is entirely REST based, and our checkout experience is seamless, with no redirects away from your website. We offer 24x7 support. Q. How can i start using Razorpay? You can register on our dashboard at dashboard.razorpay.com, fill the required details and upload the necessary documents. We will verify your activation form and pass on to you regarding additional requirements, if any, over mail. We will then get your form verified from various banks and you can start accepting payments. Q. What all documents are required for verification process? One Business Proof (Certificate of Incorporation, Partnership deed, service tax, VAT Registration Document), Firm/Company PAN (Not for Proprietorship), Promoter's PAN (Proprietor/director), Business Address Proof of the firm/company. Q. What all currencies are currently supported? Currently, we only support INR as the final payment currency.